Looking for an extraordinary plant for your collection? We specialize in the amazing Carrion Lilies - Amorphophallus! We have the largest collection of Carrion Lilies or Amorphophallus in Australia , they are bizarre, and beautiful! 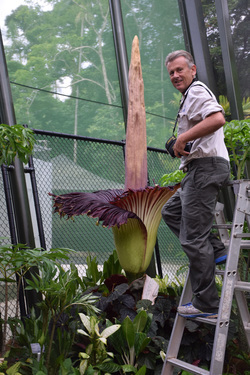 This incredible genus contains the largest floral inflorescence in the world, the Titan Arum, however flowers of this genus range in size from only a few millimetres high to over 3 metres. The range of shapes and colours of flowers is astounding, why not join the huge group of growers collecting of this unique genus. Available as dormant tubers May to October. Click here to see what I have for sale!